The following game-inspired illustration was produced by artist Glen Brogan of the Albino Raven blog for his just-closed Gallery1988 show. 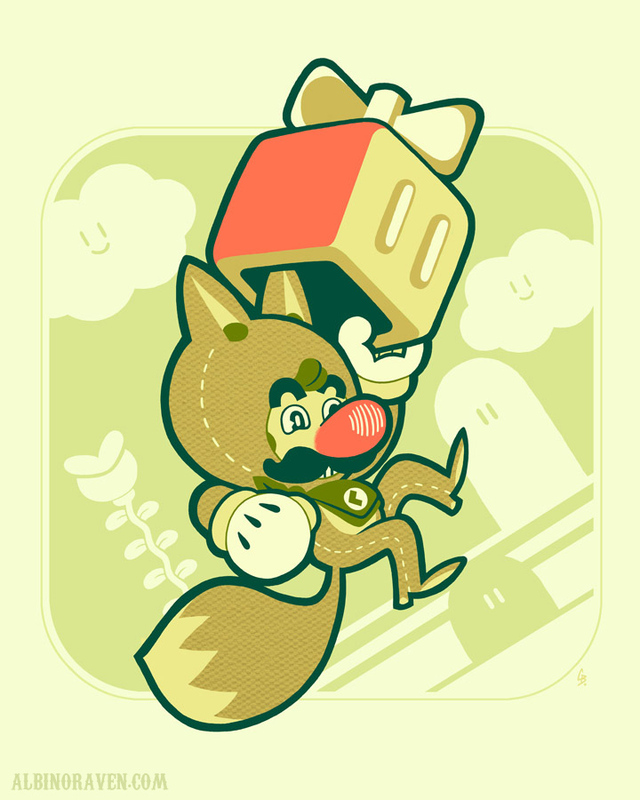 The focus of this stylish piece isn't a tanooki-suited Mario, by the way; it's a fox-suited Luigi--or whatever the hell it is Mario's main bro turns into when he grabs a Super Leaf power-ip in Super Mario 3D Land. "As a kid I often found myself playing video games as player two, usually either because the other kid was older or because I was (and am) pretty shy and non-assertive. Because of that I still to this day have a fondness for Luigi, the ultimate second player character." I preordered the retail-version of Super Luigi U and I'm looking forward to Mario & Luigi Dream Team Bros..
Ok, to be honest I haven't bought Super Luigi U because of Luigi but because of the limited retail-version but I'm happy that Luigi finally get's his own Jump 'n Run "game" even though it's more an add-on. Really? I'm always kind of surprised when I hear people say that. Why is it, by the way? Because he's adorably dorky? Because he's always been the sidekick, in the background? Hm, well as you know I'm not exactly the biggest Mario fan, but I always loved how dorky he was and the way he kicks his legs when he jumps! The goofier the better, I say!